Home » Project Issues – Turning Negatives Into Positives! Project Issues – Turning Negatives Into Positives! Are your project issues spiraling out of control even when you faithfully log them? Passive Management: It’s very easy to be lulled into a false sense of security when you have logged an issue so that you won’t forget to deal with it at a later date. If you don’t have a strategy for managing issues, they will come back to haunt you. This is especially true if you are managing a very large project or program. It may be part of the process for team leaders or project leaders, in the case of a program, to have the responsibility of managing their issues. The issues may be logged, but that does not mean they are being managed. This may be all too obvious if you take a look at the logs to see how often the entries are updated. Has someone been assigned to resolve the issue? Has an action been agreed? Has a due date been decided? Another symptom of issues not being managed is their recurrence in project reporting over a long period of time. This is damaging to your credibility as the project manager. Active Management: Consistent with the focus of Project Management Insights, the key is to engage the responsible people. In this case, it may even be a good idea to offer to run issue management sessions for your team leaders or project leaders. They will love you for relieving them of some of their burden! But more about getting them to take back responsibility later. At the very least, if it is your responsibility anyway, make sure you do include issue management time in your project plan. 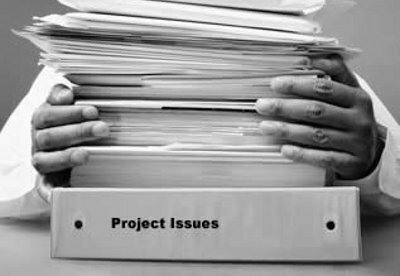 Don’t leave it to your project progress meetings, where you should simply be summarize the issues status and possibly highlighting the top three critical issues only. See issue management as a great opportunity to really engage with people, getting to know both them and the project better. Helping people resolve issues, even in a facilitative way, really does endear them to you. And as I’ve said elsewhere, once the people are on board, they will work to see the project succeed as much as you. Getting project people to own a process can be difficult and is not always achieved by education or a simple training session. You will often need to coach by example. Once people see the process in action and participate in it under your guidance and facilitation, they will begin to assimilate it as their own. This is extremely important, because the day will come when you can hand over the management of the project issues to the appropriate person. By that time, the team or project leader will be comfortable with the approach and take over the responsibility for the management of the project issues. That is an excellent result and well worth the investment of your time!